Will withstand the impact from years of stone chipping and weathering, and is guaranteed to remain optically clear year after year. The patented acrylic adhesive will withstand lubricants, oils, UV rays, and unlike the competition, also contains an anti-corrosion polymer which inhibits rust and mold growth. Our new formulation now allows our installers to handle the film aggressively without leaving finger prints or stretch marks in the adhesive even on black vehicles! The easiest paint protection film on the market to install! Ventureshield has developed this urethane film to be extremely flexible, which will enable our installers to complete even the most difficult installations quicker and easier than ever before. The product has an optically clear, high gloss finish that is a direct result of the internal make-up of our urethane; it does not have a clear coat in order to obtain these amazing results, and it does not require a clear coat to maintain this brilliant clarity year after year. This feature allows our installers to install and clean the urethane aggressively, without scratching the surface, which is extremely helpful when removing bugs from the front of the vehicle. Because the film is 100% aliphatic urethane, and does not require a protective top coat, it lends itself to other methods of cleaning. We were able to clean film that had been exposed, without a single car wash, for 2 years to pristine condition! Its extremely conformable around high radius corners, meaning a faster install with no wrinks, stretch marks or fingerprints in the adhesive! Stock widths of 24″ (610) 36″ (915) and 60″ (1500) rolls. During Nissan & Mercedes testing, the leading competition paint protection film was punctured with a 9lb probe; this paint protection film was not punctured until 20lb of pressure was applied. Therefore, the paint protection film is over 100% more abrasive resistant, meaning no paint damage! Greater long term durability the urethanes physical properties don’t degrade with wear. Paintguard Paint Protection Film – Paint gard that car and motor bike with the clearest & strongest paint protection film.Our service also features for that lifetime paint shine. 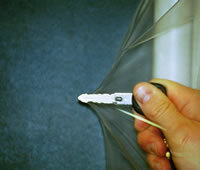 After hitting a garage wall at 8 mph the stength and puncture resistance of the film is shown. The key test. Under pressure the key can not brake through the amazing strength of the film.